When I started out building this guitar I just wanted to make a plain simple rosette with no fancy inlays, but by the end I’d blown my simple scope out of the water and ended up installing two rings of mother of pearl (which isn’t that amazing, especially mine in particular, but it was a lot more work than I had planned on and I still don’t know how I got myself into it… but it was fun… at times). Anyway this is how I did it and probably not how anyone else should do it. I began by tracing out the body outline on the soundboard using my paper template. 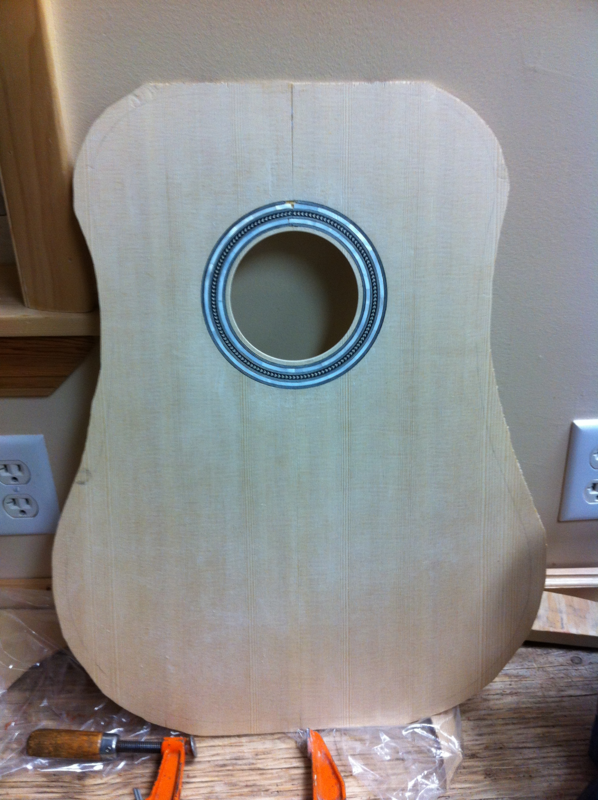 I used the middle seam of the soundboard to align the template so that the center seam would be exactly in the middle of the guitar and I maneuvered the template along the center seam to ensure the guitar would be made of the best looking wood. 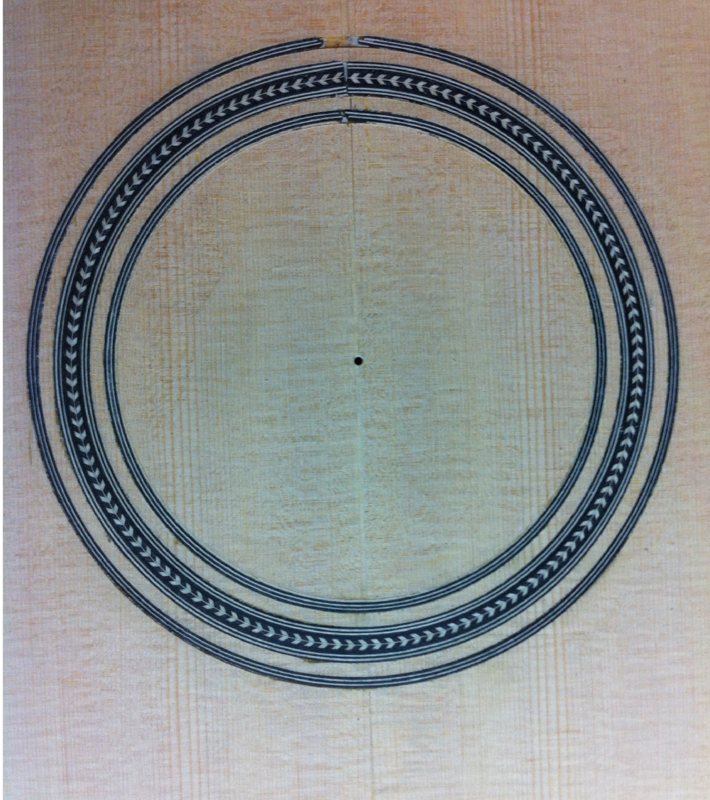 Once I had the body shape outlined on the soundboard I was able to find out exactly where the soundhole needed to be to so I could mark out the rosette design using a compass as shown below. I also took the opportunity to cutout the rough shape of the body with a coping saw, leaving about a 1/2 inch of extra material. 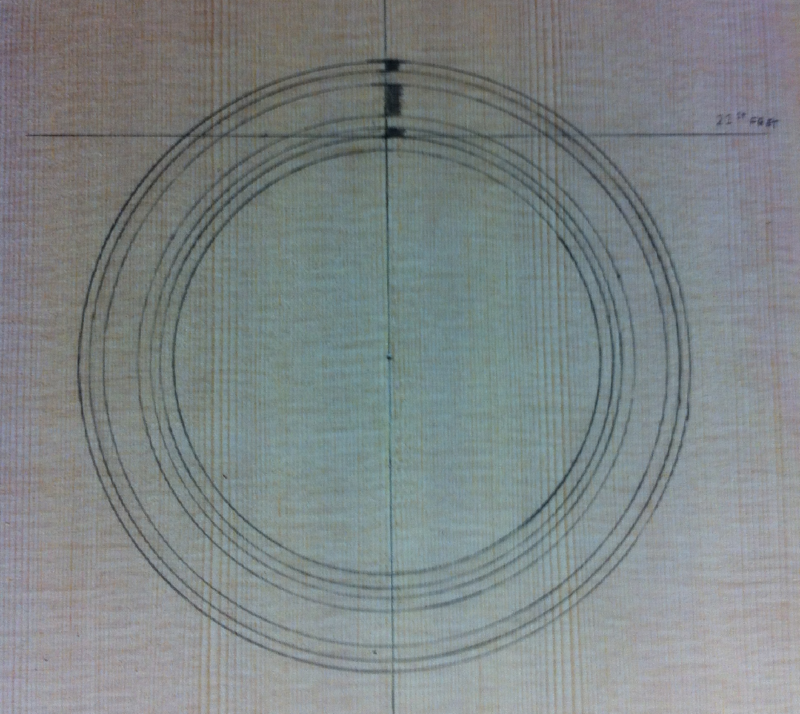 Initially I wanted to install a ring of herring bone with two black/white/black/white/black strips around it with about an 1/8th of an inch of spacing between the rings as the outline shows below. 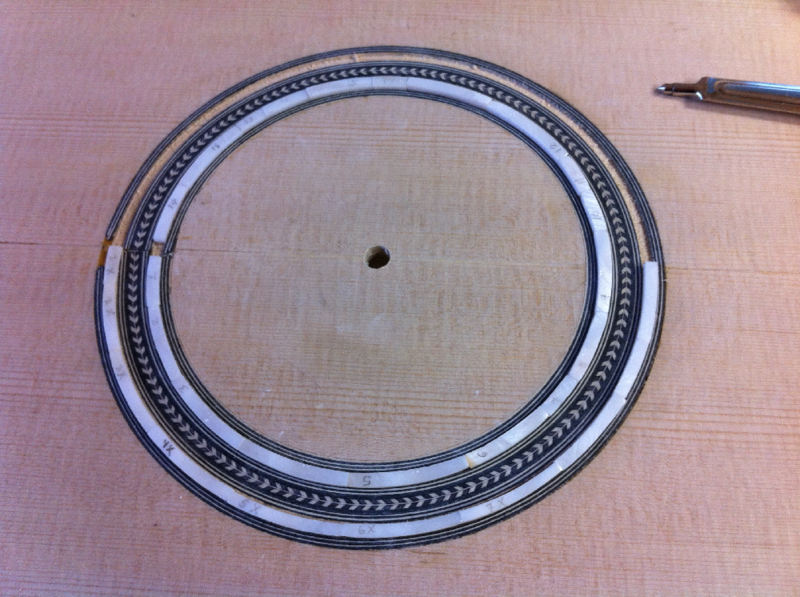 So then the next step was to cut out the ring slots to install the rosette. The thickness of my sound board was approximately 1/8th of an inch so I planned on making the inlay a little less than a 1/16th of an inch deep. I had a drill press and had planned on buying a flycutter to cut out the soundhole and make the slots for the rosette, since I figured that was really the only way to do it. However, upon reading further in Nateson and Cumpiano’s book I discovered a method of cutting out the rosette slots that required no power tools at all. 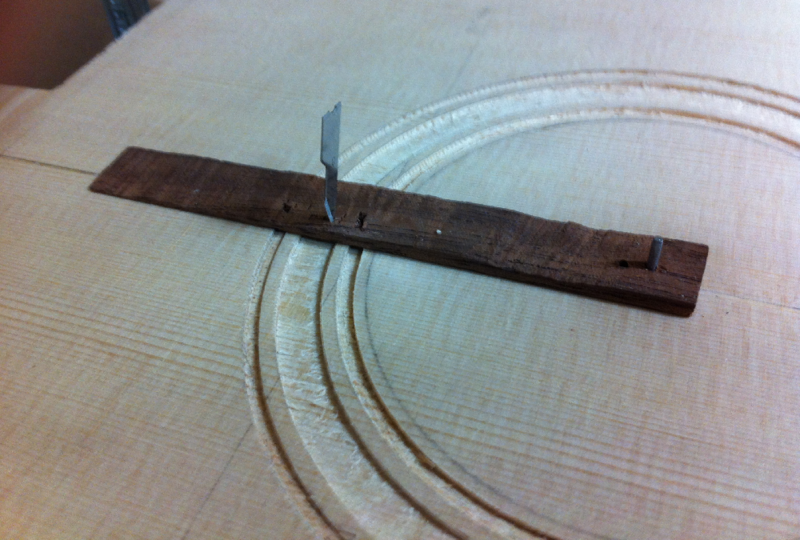 Essentially a nail is placed precisely in the center of the sound hole and a small piece of wood (they suggested a Popsicle stick) is attached at its end to the nail so that it can swivel around the nail. A sharp razor blade is then pushed into the piece of wood so that a small point sticks out the other side. The piece of wood can then be slowly turned around the nail and the razor blade cuts out a perfect circle in the soundboard. The process can then be repeated over and over again until the slot has been cut out and the rosette inlay can be installed. So there I was early one morning with my freshly drawn rosette outline just waiting to be cut out and no fly cutter. I just couldn’t wait for a fly cutter to come in the mail, so I stubbornly went about cutting out the slots with that lamentable razor blade. It actually wasn’t that bad, I was able to cut out some fairly decent slots (or at least I thought so at the time) as shown below. 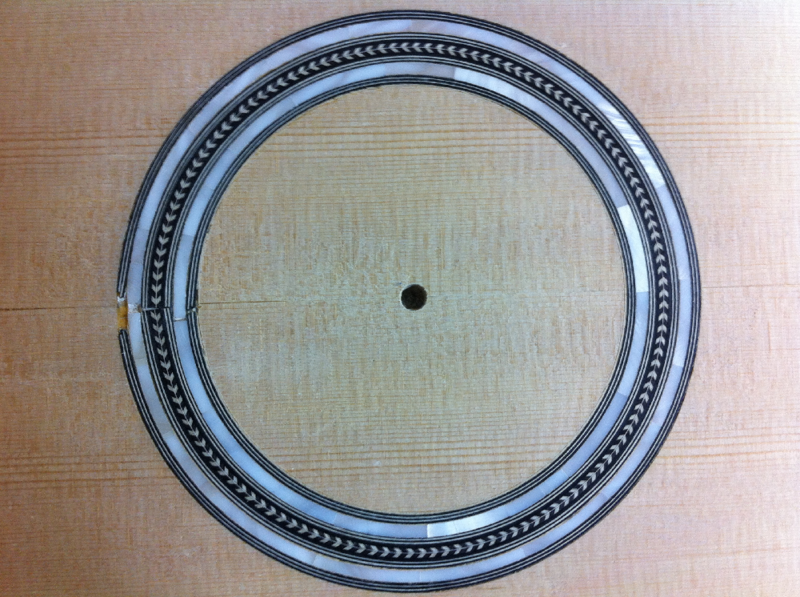 Looking back I should have paid closer attention to the words of Natelson and Cumpiano as they only suggested this method for cutting out ONE slot (like is common on a classical guitar’s rosette), not multiple slots (like is common for a steel string guitars rosette). But it worked out. I then glued in the pre-shaped rosette’s I’d bought from Stewart MacDonald. To hold them down while the glue dried I simply laid some weights on a flat board on top of some small blocks that focused the pressure onto the rosette. Once the glue dried I planed the rosette flush to the sound board first with a hand planer to remove material faster and then with a scraper to get it nice and flush with the soundboard. Planing down the rosette to reveal the fresh new material below was one of the most exciting and satisfying parts of making the guitar. The picture below shows the rosette after it had been finished with the scraper. Unfortunately, as you can see above, I damaged the soundboard wood in between the rosette rings while I was cutting the slots with the razor blade, and that kind of bothered me. Had I used a fly cutter I probably would have avoided that problem. So lesson I still need to learn: have patience and take the time to get the right tool for the job. That night I went to bed kind of bummed that the soundboard had some chips in the rosette ring, but I distinctly remember right before falling asleep having the bright idea: if the soundboard is only chipped inside of the rings of the rosette then why don’t I just cut that soundboard wood out and put something else in, like some mother of pearl! So that’s what I did. Thankfully this time around I waited until I got a fly cutter to cut out the rest of the wood. I found it relatively easy to use. 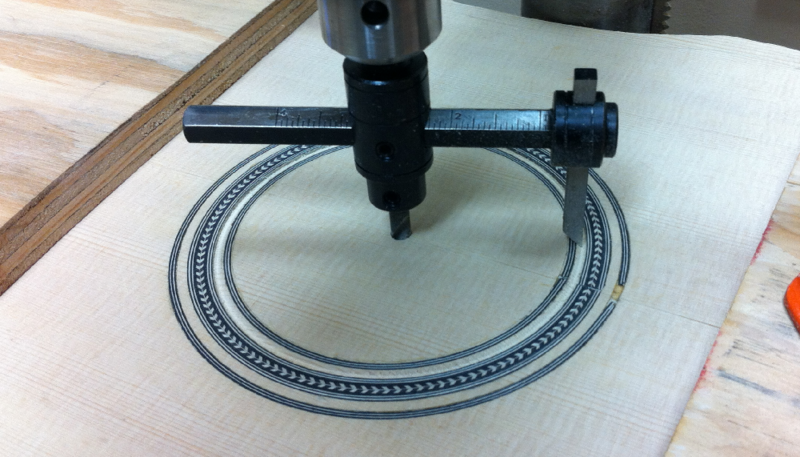 Because of the way it works it always makes perfect circles and it can be set very precisely. I did set the drill press to its lowest rpm setting, because using the fly cutter is kind of scary since its so inherently unbalanced, but as long as I kept everything tightened and under control it really wasn’t bad at all. The results of the fly cutter are shown below. The drill press that I was using had its own depth stop and that made it really easy to cut uniform slots. Now that I look back using a fly cutter is really the only way I would want to do it again – its easy to use and allows for such fine adjustments. So the next step was to fill the new slots with some mother of pearl. Thankfully I have a great friend who let me borrow his jewelers saw and some discs of white mother of pearl and away I went. The picture below shows the pieces of mother of pearl dry fitted into their places as I cut each one out. I’ll be honest, it was tedious work cutting each one out by hand, especially since I’d never done anything like it before. I would place a blank piece of mother of pearl over the slot and then use a compass to draw the inside and outside arcs onto the blank. Then I’d cut out the piece and then sand down the edges to get them smooth – I had a belt sander clamped into a vice with a guide that was squared up to the sanding belt which I used to smooth the edges. 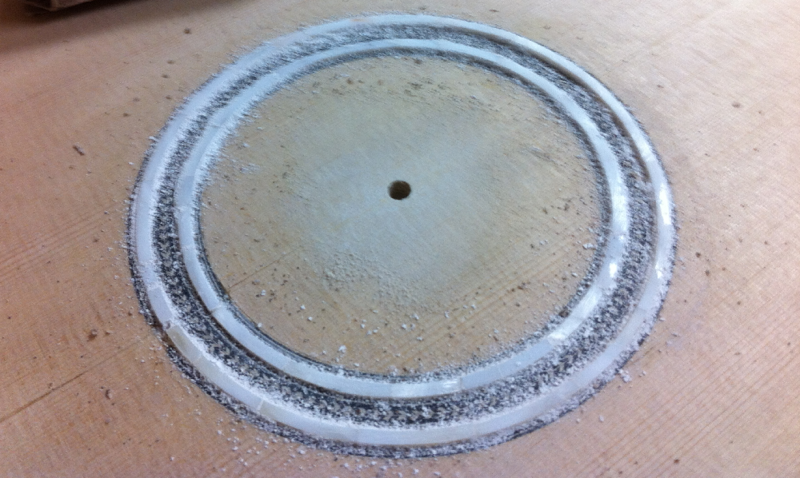 If I did it again I’d take the time to make a wooden sanding disc to fit in a drill press, perhaps by using a fly cutter to make the discs the exact radius of the inside arc of the mother of pearl rings. That would have saved some time and I would have ended up with a better product. Once I had all of the pieces cut I glued them in doing about 3 or 4 pieces at a time. I found it helpful to number the pieces so I didn’t mix them or place them upside down up as I took them out to glue them in. After the glued dried I then planed the rings of mother of pearl down flush to the soundboard, using a combination of hand planing, sanding (60 grit paper), and scraping. I tried my best not to damage the soundboard or to rub in any pearl dust. Eventually I managed to get the mother of pearl planed flush to the soundboard and by some miracle it turned out alright, not perfect, but halfway decent. 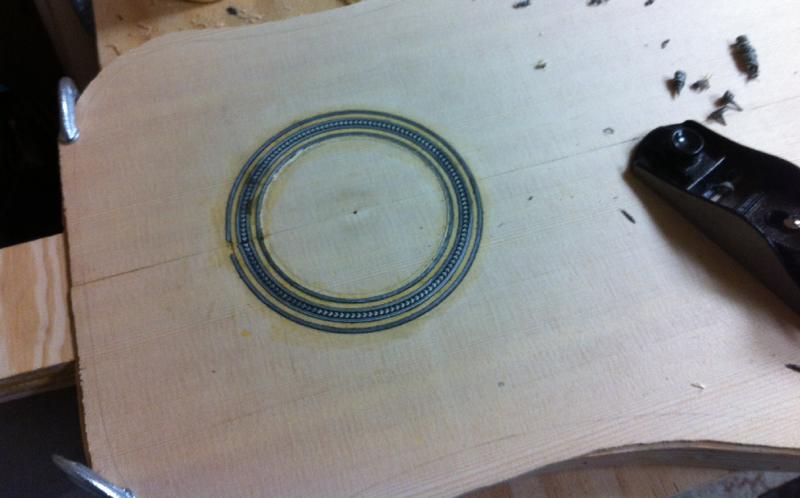 The final step was to cut out the soundhole using the fly cutter. With the rosette completed I was ready to moved on to my next task: soundboard bracing. Can you tell me what brand of fly cutter you used and where you got it? It seems like a much more cost effective tool than some of the things sold on luthier supply stores. Rosette looks great! I’ve no problems at all with it. Hope that helps!